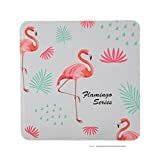 A typical coaster may protect your tabletop finish from condensation rings, but it doesn't offer any protection from catastrophic spills caused by clumsy guests, wild children, curious cats, and possibly even yourself. This cool new TableCoaster is the better solution. 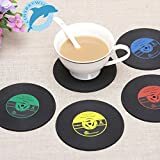 Combining the best of a cupholder and a coaster, this innovative one-size fits all, anti-spill drink-holding device secures down to smooth surfaces with a strong micro-suction base and leaves behind no residue when moved. 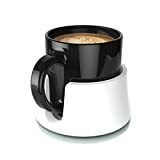 It supports coffee mugs and tumblers up to 3.5" wide, includes a convenient slot for cup handles, and has a removable adapter for holding bottles and cans as well. Perfect for coffee tables, dining tables, boats, RVs, desktops, nightstands, patio furniture, or, again, anytime you'll be drinking with an evil cat nearby. Also be sure to check out the equally cool CouchCoaster as well.